McDonald's is serving up Peach Smoothies in select markets this summer. 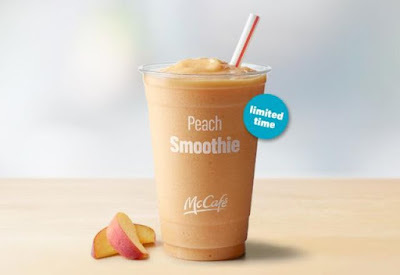 The frosty beverage features a blend of peach puree, ice, pineapple juice concentrate, apple juice concentrate, banana puree, and yogurt. Markets where the smoothie has been spotted in include areas of Florida, Georgia, New Jersey, and Pennsylvania. The chain has also been testing Slushies in select areas. If you happen to be in North Carolina, they're offering Peach Pies there this summer.